“Guilt is simply self-imposed punishment thrust on us by civilization. Isn’t that what you said? “Sexual needs are rights, and no one should be expected to live without gratifying them,” he said, putting down his cigar. “If you want to look at it that way. It’s the truth. Guilt is imposed by society to stop us from loving who we want to love. Don’t you want to be with me?” he asked, his eyes softening. When my professors at Wittenberg University taught me about Sigmund Freud, they spoke all about his theories: the id, the ego and the superego vying for attention; neurosis which could be absolved by “the talking cure”; the analysis of dreams to uncover one’s repressions; everything about our psyche having its root in sexuality. But never, in all the course of earning a B.A. in Psychology, did any one discuss the fact, or even the supposition, that Freud slept with his sister-in-law. How fascinating then to read of Minna Bernays, a woman in her early thirties who was swept away by Freud’s charms. Totally unfulfilled in her life as a governess, she came to the Freud’s house with no where to go and was heartily welcomed in. What a wonderful help she could be to her sister, Martha, who was exhausted by the care six children required. What an interesting woman she was for Sigmund to charm. Despite her intentions to stay away from him, she eventually succumbs to his advances and their mutual desire. This novel is their story. Freud’s Mistress reminds me in so many ways of Loving Frank and The Paris Wife. All three novels are riveting in the way they capture illicit love affairs and the havoc they wreak on those around them. All three of them bring the central male, be it Frank Lloyd Wright, Ernest Hemingway, or Sigmund Freud, to a light that not many professors are willing to reveal. And their poor women…like I did for Anna Karenina or Madame Bovary, my heart leapt at their vulnerability. If only they had had the strength to withstand those amorous advances, so much pain could have been spared. I read Freud’s Mistress in one day. It was a captivating read for anyone interested in historical fiction, the life of Sigmund Freud, or the effects of love affairs with married men. I loved it for all three. The story of their visit to the Swiss Alps is included in this novel. It sounded like a most luxurious time! I'll have to compare it with the NYTimes article you sent me. How interesting that both you and Ally found Freud related links for us! Thank you. Ally, it was an especially interesting read to me because of my BA in Psychology. I loved reading of other familiar psychologists of he time, such as Breuer, and rereading that Freud was not well received at first. All of those guys fascinate me with their theories, and I guess I'm always lookin to understand the way that we think. Or, why we do the things we do. Freud made it awfully easy to have an affair. He could justify anything by his own analysis! 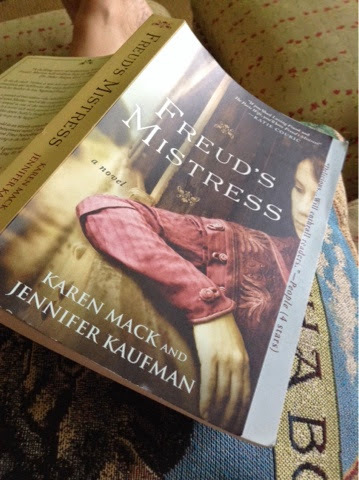 Having enjoyed the Paris Wife and Loving Frank, I perhaps need to add Freud's Mistress to always growing TBR shelf. Using Ally's line above, but with a twist: I'm interested in everything … Karen Mack and Jennifer Kaufman write. A few years ago I was fascinated by their first book Literacy and Longing in L.A., freshly introduced to the term 'intellectual chick lit'. Then a few years later listened to their next book, A Version of the Truth, and kept entertained while driving. Thanks so much for posting about this one, Bellezza. I didn't know about it until now, and yes, I must get a hold of it. Hope it's as fun and humorous as the other two. I think these two writers have developed a style, maybe even a genre of their own. Will soon find out about this one… albeit I have a feeling it's a bit more 'serious'. I thought Loving Frank was fantastic, but wasn't as impressed with The Paris Wife. It was good, but didn't have the same impact on me as Loving Frank. Now, The Aviator's Wife is another that is very well-written and fascinating. There are lots of these sort of books out right now, aren't there? I'll probably get to this one someday, especially if you enjoyed it so well that you were able to read it in one day! Arti, I hadn't known about the other books these authors wrote. This particular novel is not necessarily funny, in fact I found it rather sad. Poor Minna, who had such a difficult time finding her place was consequently swept away by Freud's charms. It portrays her life quite well, I imagine, along with giving us more insight into Freud's personal life. I would say Freud's Mistress most closely resembles Loving Frank. You walk away feeling like you knew the people quite intimately. As for The Aviator's Wife (I almost wrote Anita Shreve's The Pilot's Wife!) I have not read it. But, I remember you liking it very much.